Steering Clamp Carli's Low Mount Stabilizer is an "Internal Floating Piston" shock. This means there is an internal dividing piston which keeps the oil and nitrogen separated. 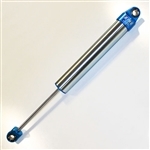 The nitrogen gas maintains constant pressure against the low mass "floating" dividing piston Carli Stainless Low Mount Stabilizer is a must-have addition if you are running larger tires or suffering from lack of control due to your worn out factory stabilizer.